electronics (playback) and a punchcard score object. for her solo program voiceXtensions with Michael Vorfeld. The recording was supported by Sound and Music soundandmusic.org as part of their New Voices 2015 program. Eine meterlange Partitur auf Lochkartenrollen von Strickmaschinen dient zur Notation und als Objekt; im meinem Stück sind Punktuation und Musterbildung zentrale Themen. Das Regelwerk der Punktuation strukturiert die Sprache, verhindert Mehrdeutigkeit, und mittels gestanzter Lochkarten lassen sich Maschinen aller Art auf analoge Weise ansteuern. Ute Wassermann preparing for performance, Michael Vorfeld’s projection on the wall. In this work I use punctuation as an inspiration and compositional principle. Punctuation helps to structure the flow of language. Punctuation opens up space, for another level of communication. Emotions can enter through cracks into the flow of language. Punctuation disrupts the text, at certain points. I find it interesting to investigate the nature of precisely these tipping stages, where one level of sounds shifts into another level, into another part of the flow. I employ a range of notation techniques to present this composition. 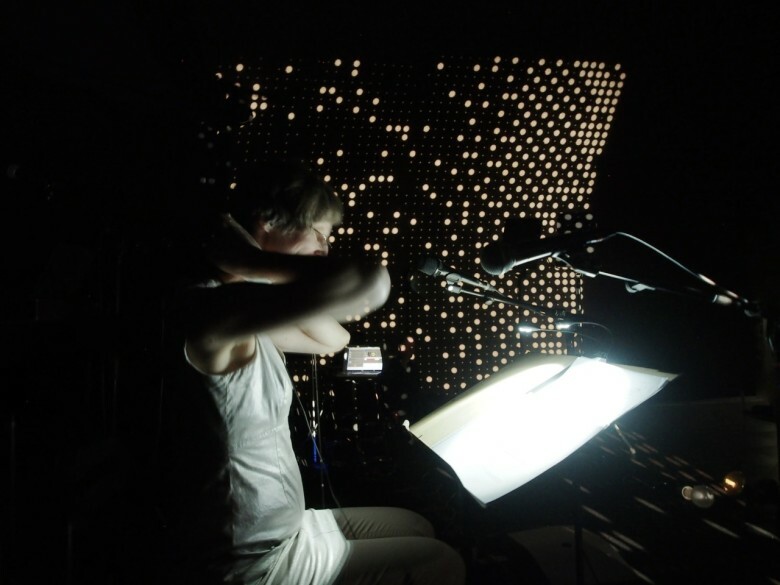 The performance package contains performance instructions and the text, a written score for mezzo, an electronic track (playback), and a graphic punchcard score as a performative scenic element. 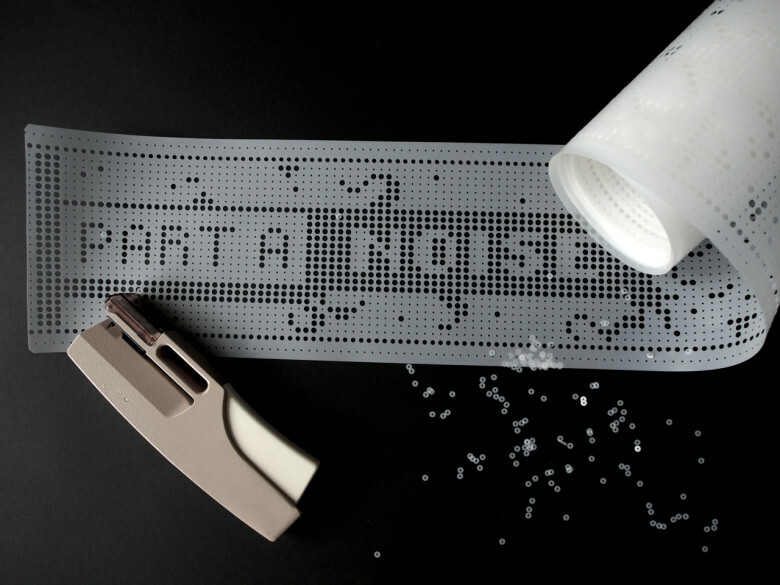 Punchcards are patterned to control a knitting machine, for example. A substantial number of holes is needed to form a pattern. At least, three holes. The performer wears a throat microphone, with a possibility to switch it on/off with a foot pedal. 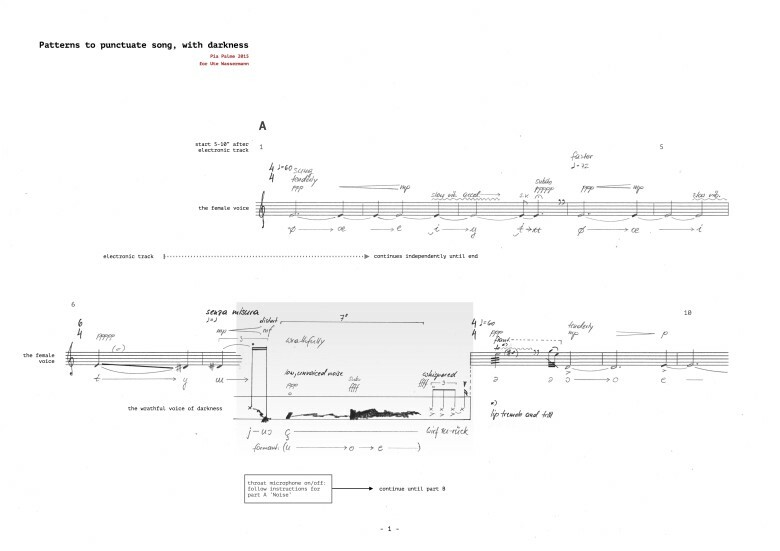 Throughout the piece, the throat microphone is used to highlight specific vocal productions by means of amplification and distortion; sonic moments aurally punctuate the performance. 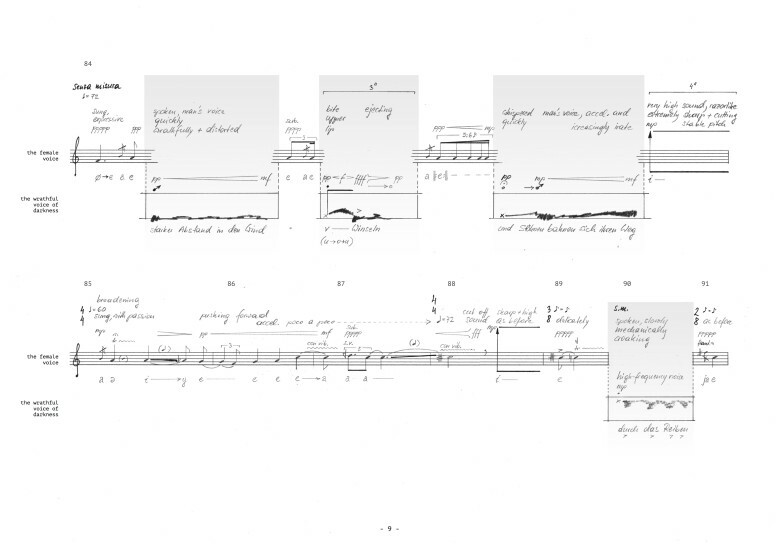 Five sections are defined in the score; in every section, the throat microphone is used in a different way. The punchcard score is a graphic representation and comment of these instructions. 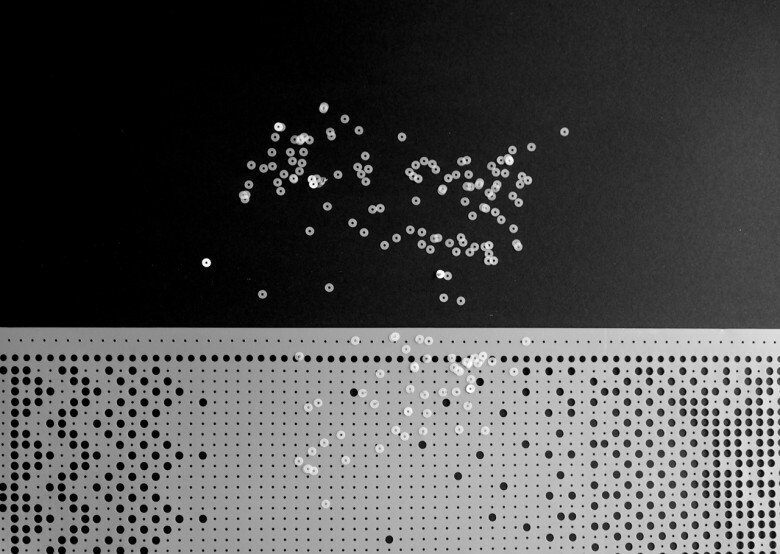 The punchcard score is an essential part of the piece. 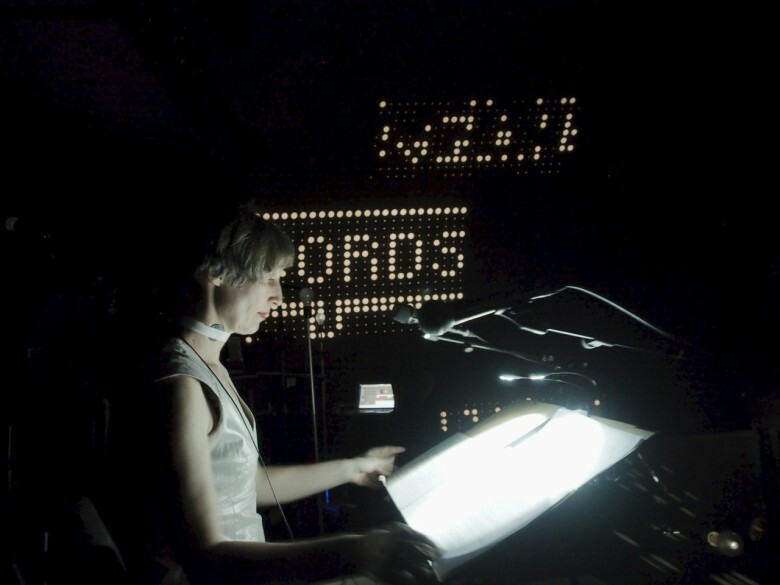 The score can be held or moved by the vocalist during the performance. Alternatively, it can be displayed on stage as an installative element (use appropriate stage lighting), or used for a projection, as was done here. I also made a video as an alternative. 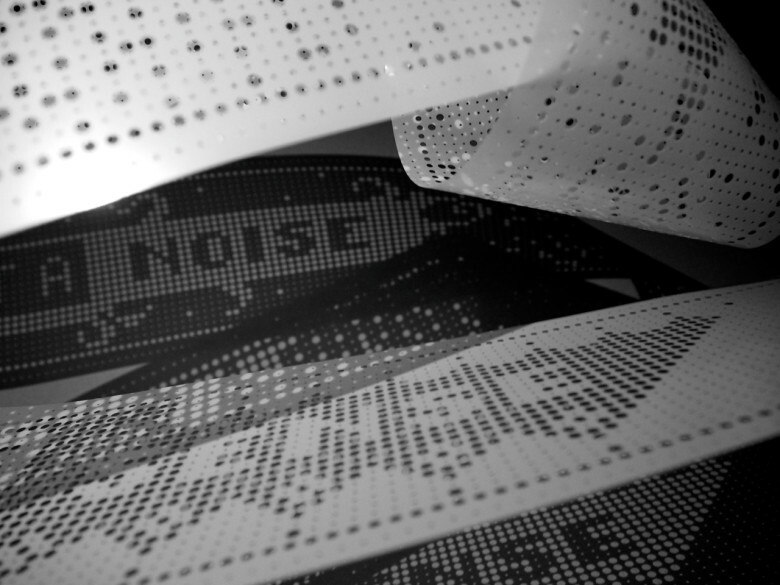 The playback composition starts with samples of sounds made with a punch tool, recorded during the making of the punchcard score.